Food Market Hub is a cloud-based platform that helps F&B businesses easily manage supply orders and keep track of inventory and costs, making it easy for them to understand their purchasing habits and save time on supply management. The platform was created by Malaysian Anthony See in late 2017 and has already expanded to serve Hong Kong, Thailand, and Singapore. Two years ago, ex-Intel Solutions Architect Anthony See went into the food business. He invested a good sum of money into a promising F&B venture, with the outlook positive and things going well during the early days. A while later, however, poor management of the business caused the venture to incur high costs, mainly due to waste of food. Eventually, the venture failed and Anthony and his partners were left scratching their heads—confused as to what they could and should have done to save their business from tanking. After careful pondering, they found that everything eventually led back to the lack of a structure in the inventory and ordering chain—something large, established, and more successful F&B businesses knew how to maintain. “I realised that they had systems to help them manage food costs and inventories which many small F&B businesses can’t afford” Anthony said. With his techie instincts tingling, he set out to build something that would eventually be able to benefit small F&B businesses the same way big restaurant chains benefited from expensive management platforms. Eventually in October 2017, Anthony, together with four other developers, created Food Market Hub—a cloud-based platform purposed to automate the purchasing and inventory-tracking process and help F&B business owners get a clearer and more streamlined picture of their day-to-day operations. The way Food Market Hub works is by acting as an easy-to-navigate platform that connects F&B outlets to their central kitchens and product suppliers, cutting through the clutter of having to go through multiple channels of communication and saving precious minutes that eventually add up significantly. F&B restaurants (cafes, restaurants, etc.) place orders for ingredients or other supplies. Purchasers in charge either approve, alter, or decline the orders. The Food Market Hub platform sends out approved orders to central kitchens or third-party suppliers. Central kitchens and third-party suppliers receive orders and then deliver them. Central kitchen inventories are auto-updated. Orders are received by outlet staff and outlet inventories are automatically updated. Costs are also automatically imported into buyers’ accounting systems without having the need for manual input. Speaking about tackling problems in the supply chain, Anthony said that one of the biggest issues with traditional F&B management is the lack of data that businesses can use to assess their ordering, usage, and spending habits. He suggested that oftentimes the downfall of a food business is down to managers and owners not realising just how much they’re spending and eventually getting caught unawares. To solve this particular problem, Food Market Hub also offers automated ordering while employing artificial intelligence and big data. According to Anthony, these will help ensure that F&B businesses can always keep track of their expenditures in detail while allowing them to maintain Just-in-Time (JIT) inventory levels—meaning that they can order just the right amount at the right time and keep their cashflows tight. Additionally, Anthony revealed that Food Market Hub was now also working closely with warehouse, suppliers, and logistics partners to offer supply chain services and product listings so cafes and restaurants can easily perform all relevant tasks on their platform. Another perk of using Food Market Hub is to do with the Point of Service (POS) systems at restaurants and cafes. By not tying their platform to any particular POS platform, Food Market Hub is able to be used with other popular POS systems in the market. This all means more versatility of users of their platform, with orders, inventory checks, and other tasks able to be performed on (currently) six POS platforms as well smartphones or tablets. “This means that POS system vendors love working with Food Market Hub as they can now offer end-to-end services for their existing customers,” Anthony said. In terms of monetisation, Food Market Hub employs a different method for each type of clientele—they charge restaurants annual fees to use their platform, suppliers pay for listings and for transactions made, and they also offer F&B chains a supply chain service that helps them centralise their procurements and inventory without the hassle of setting up their own warehouse or logistics facilities. Right now, Food Market Hub are targeting multi-outlet F&B chains, hotels, canteen operators, and central kitchens in Malaysia as well as Singapore, Hong Kong, and Thailand, with prominent F&B names such as Din Tai Fung, dahmakan, Paradise Group, myBurgerlab, and Rhombus Connexion all counted on their list of clientele. With regards to performance, Anthony said that Food Market Hub are processing RM12 million in transactions monthly between F&B, suppliers, and central kitchens, but also thinks they can hit quadruple that figure by the end of 2019. 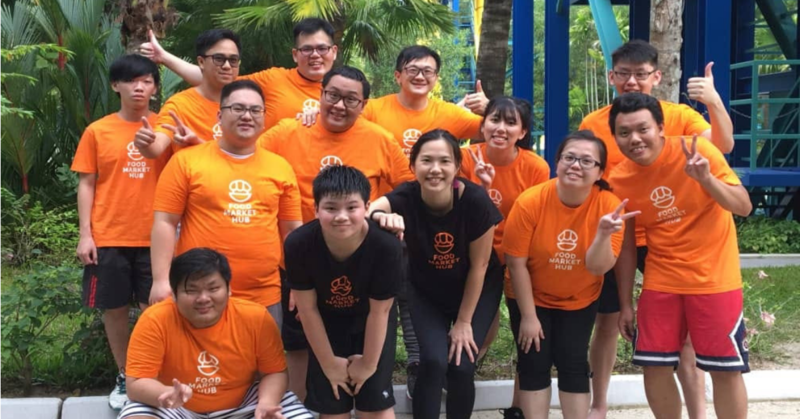 This all comes in addition to the recognition they’ve garnered from the rest of the industry including getting Top 4 on the reality TV show Bizsmart, being award the CIP300 Grant, and getting awarded the iSeedFund in Penang where they have a strong presence in. Before all that though, Anthony thinks that there are a few hurdles to overcome before hitting more lofty goals like that one, the first being keeping up speed of execution. “The world changes so fast, we need to capture the market quick and efficient and work on solutions with as minimal capital as possible,” he said. For them, this especially holds true considering the comprehensiveness of their platform and the fact that they need to constantly keep it as up-to-date as possible. For Anthony and his team, the race is now on to move ahead and offer even more benefits to F&B businesses. For 2019 in particular, they plan to offer a service to restaurant groups that will help them set up entire supply chains, with warehouses in the Klang Valley, Penang, and Johor being identified. For the international market, they also plan to set up a subsidiary in Hong Kong, partner up with master dealers in Taiwan, Thailand, Singapore, and Vietnam, and eventually also plan to enter the Philippines and Indonesia. While these goals may seem pretty ambitious, Anthony is upbeat about their prospects, with their so far robust growth (they expanded to Taiwan, Hong Kong, and Singapore within 12 months of starting up) and the demand for big data and AI-based services constantly increasing everywhere you look. You can find out more about Food Market Hub on their website or Facebook page.